It should not have surprised me that Singletrack listed Moab at the “top” of their listicle (after all, Moab is often referred to as “The Mountain Biking Capital Of The World.”) And yet, I was surprised. Moab is not known as a winter recreation hot spot. The reasons for that are varied, as is the amount of winter precipitation. Some winters, Moab can receive up to a foot of snow, or more. And sometimes, due to continuous cold and dry conditions, that snow will linger on the ground for weeks or months. But other years, entire months can pass without a single snowflake or drop of rain. 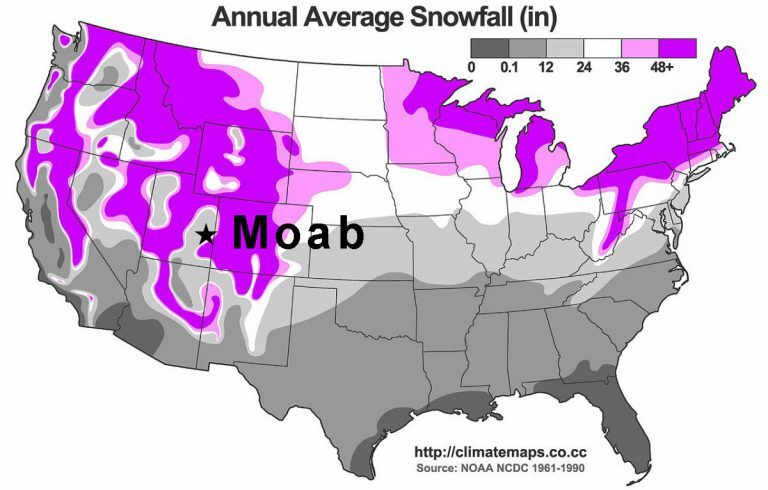 Last winter, for example, according to The Old Farmer’s Almanac, Moab received zero precipitation through the first three weeks of December. Then, on Dec. 21 it got .03 inches and on the following day it got .32 inches. And that was it for the rest of the month. Last winter was one of Moab’s driest. Due to its 4,000 foot elevation, Moab in December is often fairly cold – average lows range around 20 degrees, while highs might average just above 40. 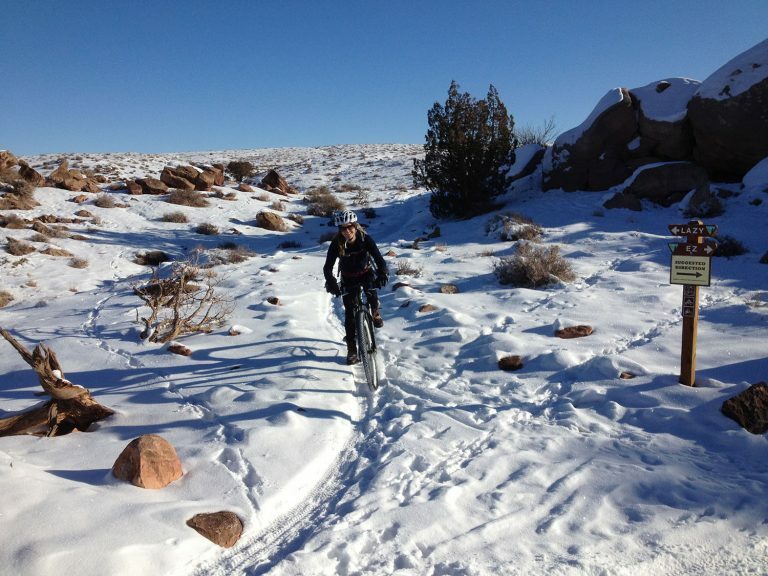 When Moab has snow cover, the biking trails can be nearly unusable. And even if an intrepid biker were able to negotiate the trail, riding on it when the soil is soften by snow can severely damage the trail. The best advice for bikers considering a visit to Moab during December and January is to call ahead to check trail conditions. Hands: Bring at least two pairs of gloves. If one pair gets soaked with sweat, you’ll have a second pair. The hands are the most vulnerable to wind chill. Head: Your helmet is designed for cooling. Buy a thin-fabric stocking cap to wear under your helmet. Most stocking caps are too bulky to fit under your helmet or will be too warm. Having this extra warmth on your head is key, but you also don’t want it too warm or you’ll be shedding it mid-ride. And, on super cold or windy days, consider a balaclava face warmer. Feet: (Pro Tip) When dressing in the morning, after you put on your socks, wrap some thin plastic wrap, or even the corner of a plastic shopping bag, over your toes. Then put on your mountain biking shoes. This extra layer of wind resistance will key your toes from freezing. Start with a thin, wicking layer with long sleeves (merino wool is excellent). Add a medium weight long sleeve layer like a 1 /4 zip poly fleece pullover. Wear a wind-breaking outer layer with some insulation like a soft shell jacket. Knickers with knee socks are an excellent choice. Depending on temperature and wind expected, full length tights might be appropriate. Some riders prefer leg warmers to full length tights for better flexibility. When possible, plan your ride to put the majority of the climbing at the beginning, in order to build up body heat. Even though the temperatures are cold, the air is still super dry! It’s easy to forget to drink enough when riding in winter. If it’s below freezing, hydration tubes might become iced up so consider an insulated water bottle inside your backpack. For some folks, this is a no-brainer, but for others, it will pay to be aware of the extra toll the low temps take on your body and to perhaps shorten your ride. Also, be aware of the potential for ice on north-facing slopes, where the sun fails to shine.